British Army desert camo combat shirt / jacket. Poly cotton. 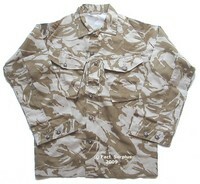 Chest pockets, front rank tab, button fastening. Very good G1 condition. Medium. 38" - 40" chest, 180cm tall. Br. 180/96. Medium. 38" - 40" chest, 190cm tall. Br. 190/96. Large. 40" - 42" chest, 180cm tall. Br. 180/104. Large. 40" - 42" chest, 190cm tall. Br. 190/104. XLarge. 42" - 44" chest, 170cm tall. Br. 170/112. XLarge. 42" - 44" chest, 180cm tall. Br. 180/112. XLarge. 42" - 44" chest, 180cm tall. Br. 180/112. Brand New. XLarge. 42" - 44" chest, 190cm tall. Br. 190/112.